Photographer: Rachel Maucieri | Interview of: Rebekah Murray of Virginia Dare Dress Co. This dress company began just with me wanting to have some dresses made for myself, but my parents encouraged me to try to make a company out of it and turns out they have some pretty great ideas. I was traveling a lot for my work as a wedding photographer and I wanted more dresses to pack on these trips, especially when I was going around the UK. I have a pretty simple clothing style but I like to feel feminine, and dresses became more of my go-to choice when I started wearing them during the day. When I'd shop specifically for everyday dresses I kept noticing how most of them were on the short side (especially for a tall girL) and most just didn't seem that pretty. There are plenty of beautiful dresses in more contemporary styles, but I just decided it wasn't me, and I figured maybe some other girls felt the same way. 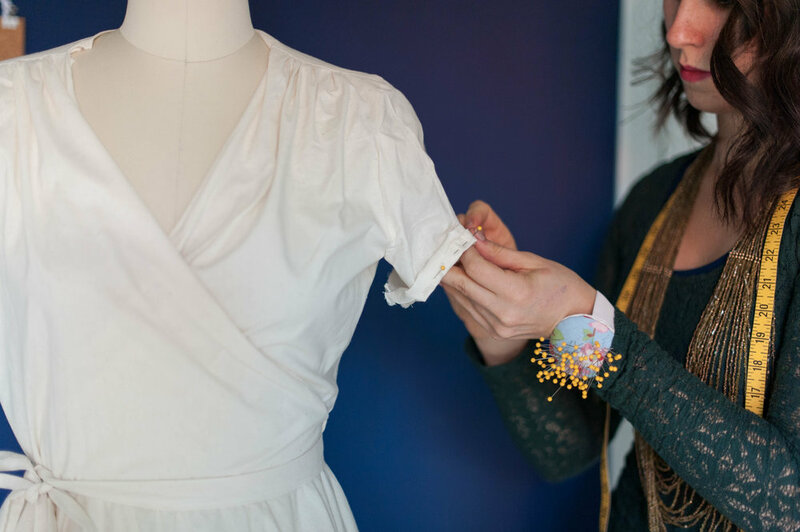 One night I googled "how to start a fashion company", started following the few-thousand rabbit trails that led to, and the Virginia Dare Dress Co. was born. One of the most important connections early on was my grandfather. He's a fashion designer in NYC and although we'd never been close, we reconnected and he gave me a contact in the Garment District who could start working on my first samples and helped me learn patternmaking. Earlier this year I switched to developing the line here in DC instead (with Rosalie of Pattern Sample Sew, who is 1000% brilliant!) kept learning a ton about working with manufacturers and fabric suppliers, had a marketing friend coach me through a lot of the practical steps towards launching, started a private Facebook group to bring a few hundred girls into this process, and then in September ran a Kickstarter campaign to pre-sell the line so I could go into production. It didn't make the full goal amount so I'm trying again today! It's running for the next two weeks and if funded will allow me to create a large production run with my factory in Guatemala and then start an online store. Experiences, more than anything. I think people can have a love for travel because they're trying to find where they belong, and I've found that most when I'm in awe of somewhere beautiful. Adding to the places we have these experiences, what we wear dramatically affects how we feel about ourselves, and really it's our emotions that affect our memories the most. In a way, I think I imagine that if I had the right clothes for the days I most want to live - those days would be more likely to happen. That's sometimes how I'll design - I'll study photographs of places and imagine a whole day playing out, and then try to picture what dresses would fit best with the story. I've also been inspired a ton by hearing other girls talk about the thought process behind how they shop or their preferencesare. Most girls will have incredibly detailed opinions on what they're looking for and it makes me realize how important and personal our clothing and style are to us. I'm not great at balance, but I'm not married or have any kids so that makes it harder/easier to feel like I need it. I've had assistants or interns for years (this year I have Abigail Gallop and she's a gem!) and I'd never want to work otherwise. No matter what job you have there are so many small tasks that can be done by someone else, which allows you to focus on the work that only you can do, and the time to do more of it. Besides assistants there are so many programs or companies that can help with certain aspects of your business (invoicing, photo retouching, etc) and I'm definitely a fan of outsourcing as much as possible. I've been self-employed for 10 years and the last few years have been especially tough with running two companies, but when you let go of lots of the smaller things, life doesn't feel as crazy even if you're still working long hours. I try to have other things I love as much as my work, and making time for hosting random get-togethers or spontaneous picnics is definitely my favorite alternative to work. Our sense of balance will change during different seasons of our lives personally or our business in its life, and it's important to adapt to each new season and find a groove you can run in. Seeing something intangible in your mind and then working to bring it to reality is the strongest motivation I know. It's incredible! We have so much to say, and as artists or writers or designers or whoever else there's nothing like that connection from imagination to reality. Learning helps keep me motivated too, whether new things about what I do or other skills completely unrelated. When you're learning I think it reassures your creativity that there's infinite more combinations of ideas out there still, and that inspires new inspiration for me. I love designing dresses and seeing them on people because I think I just love making things beautiful and making things for people. That is such a big part of photography, but now working in fashion design it feels like that connection is now possible with so many more girls. I don't have a full size run yet of my dresses but I've had a few times where a group of friends have come over to all try on the dresses and seeing how sweet and personal those group conversations are when each person is sharing their perspective and being surprised by loving a dress they wouldn't have thought to choose, it makes me feel like I have unlimited potential to try to understand my customers well enough to give that feeling too. Here is her Kickstarter link so that you can go straight there and support her dream!